Hi, I'm new here. 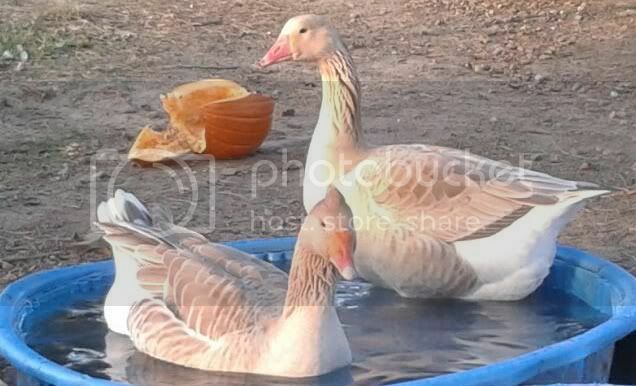 In addition to my other fowl, I have two geese that I adore. Tuffy is a tufted american buff and Lucy is a brecon buff (we think she is anyhow). I happened to catch this photo shot of the two of them yesterday, being silly in the call ducks pool and wanted to share. I know nothing about geese DGC but they look a fine pair, even to a complete novice like me. What lovely geese - I was thinking of Hawaiian geese at one time but decided we haven't enough room. They look so perfect that somehow they could be not real! Beautiful. Feather perfect. Is one crested ? Chuck wrote: Beautiful. Feather perfect. Is one crested ? Tuffy is a tufted american buff. I have two crested ducks. There's a difference between a tuft and a crest, but it's never made much sense to me. In Roumania, Buff geese are very rare. Thanks All. They are like having feathered two year olds and keep me on my toes, but I love them dearly.